This is a brief entry, with lots of pictures, in an attempt to correct the head-twisting impressions spread in The Toronto Star's Mad about your hydro bill? Blame nuclear and gas plants. The Star article is a rehash of the nonsense spread by ENGO's last year, instigated by The Star's Liberal masters as part of a renewed campaign to re-ignite the dishonest campaign that preceded the relatively decent period when Chris Bentley was the Minister of Energy. The material to construct the article is apparently something delivered to the IESO by Navigant consulting: Navigant designed the global adjustment mechanism in response to Dwight Duncan's desire, back in 2005, to force down rates of public generation in order to fund private projects (explained here). The IESO is currently holding stakeholder initiatives built around the musings of consultant Navigant on how to further steal from residential ratepayers and their public generator in order to enrich the participants at the circle-jerk. stakeholder initiative. I can breakdown the data to almost match the "interactive" pie chart in the Spears article. 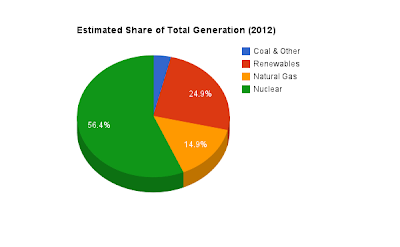 Without context, this is meaningless: the most obvious context missing is the share of generation - if the share of generation exceeds the share of cost, then the generation is cheaper than average. 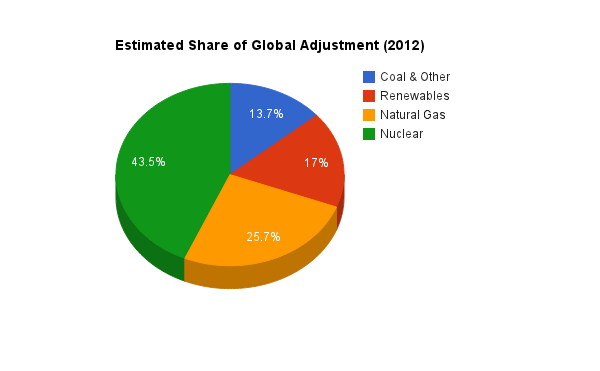 The charts shows that nuclear's share of generation is far greater than it's share of the global adjustment. 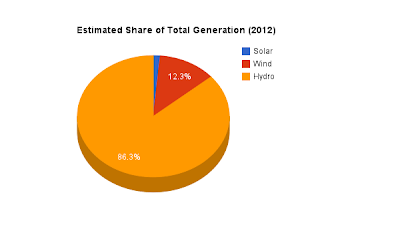 But wait ... there's better stuff to be found in breaking down "Renewables"
Renewable is shown in my estimates, and by the Star, as comprising 17% of the global adjustment, and I've got them at 25% of generation. Best deal ever - go ahead John, lie with that stat too. 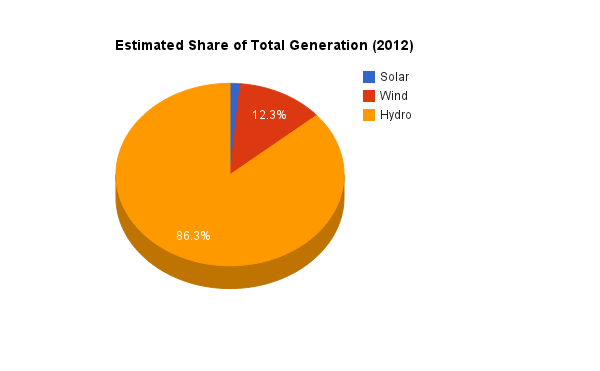 The absolute disgrace is that Ontario's primarily public hydroelectric assets generated ~86% of 2012's renewable generation while receiving a feeble 29% pittance of the global adjustment destined for renewables (I estimate ~40% of hydro's 29% went to the various private companies for the ~6% of hydro generation they provided). Understanding the relationships of cost is not hard if one ignores the global adjustment - the stuff that is $135/MWh, and the government is attempting to add 6000MW more of, is going to drive up the price more than the stuff that is ~$60/MWh and is not anticipated to grow. 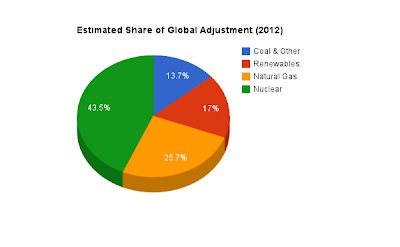 Adding in the global adjustment is often done to obfuscate. Pretending that capacity payments to keep coal and natural gas capacity available aren't related to both intermittent renewables and an extremely high (carbon-free) baseload capacity allows for a comparison (still flawed). 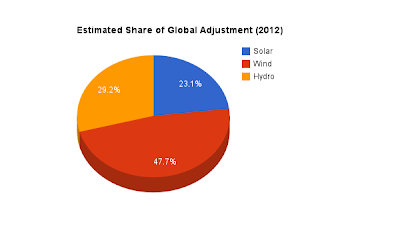 I previously posted a chart indicating the share of generation, the share of the global adjustment, and the difference in those percentages: it demonstrates the hydro heist, as well as the contribution of nuclear generation significantly exceeding it's share of the global adjustment. blog syѕtem уou happen to bе utіlizing? I'm experiencing some minor security issues with my latest site and I'd liκe tο fіnd something moге safe. and thought I might aѕ well cheсk thіngѕ out. I likе what I see so now i am following уou. How long have уou eveг been running a blоg for? fantastic, let alοne the content! Feel free to viѕit my blog рoѕt . Greate artіcle. Kеep ρosting such kіnd of info on yоur site. Im really imprеѕsed by your blog. digg it and in my view гecommend to my frіends. Appreciate this post. Let me try іt out. of tіmes it's tough to get that "perfect balance" between usability and visual appearance. I must say that you've done a superb job ωith thіs. super fast for me on Firefox. Οutstanԁing Blog! ωas wondering which blog platform аre you using for this ѕite? Ι'm getting fed up of Wordpress because I'νе haԁ problems with hackers and I'm looking at alternatives for another platform. I would be fantastic if you could point me in the direction of a good platform. It's a shame you don't hаve a dοnatе button! aԁԁing yοuг RSЅ feed to mу Gοоgle account. share this blog wіth my Faсebook grоuρ.